On 30 May 2018, Admiral Harry Harris, the retiring chief of the newly renamed U.S. Indo-Pacific Pacific Command (IndoPacom), noted that “China remains our biggest long-term challenge” and “a resurgent and revanchist Russia, remains an existential threat to the U.S” – and that consequently “Great Power competition is back.” Such competition brings Russia and China together as political partners, and is echoed in their increasing naval cooperation. Such naval cooperation provides one another with tacit support in their respective areas of geopolitical interest. Straight balancing imperatives against the U.S. bring Russia and China together. This was first evident in their 1997 “Joint Declaration on a Multipolar World and the Establishment of a New International Order,” which was followed by a Treaty of Good-Neighborliness and Friendly Cooperation signed in 2001, and proclamation of a “strategic partnership.” Joint military exercises were initiated in 2005, with maritime exercises starting in 2012. Their military cooperation has clear “geopolitical signaling” to the U.S.-led order, reflecting their maritime strategies. Following the collapse of the Soviet Union in 1992, the Russian Federation suffered a decade of chaos under Boris Yeltsin during the 1990s and with it a sharp decline in maritime power from the preceding Soviet period. Vladimir Putin has sought to establish Russia as a major power again, and to push back the advancing influence of the U.S., NATO and the EU. Military power and military assertiveness has been a feature of Putin’s presidency. Russia’s areas of strategic interest were recast on a wider scale again; “the Russian Federation identifies the Atlantic, Arctic, Pacific, Caspian, Indian Ocean and Antarctic areas as the main regional priority areas of the National Maritime Policy.” To reverse the Yeltsin-period of industrial collapse of the 1990s, a naval shipbuilding program was announced. The current rise of China is a process where economic modernization is now feeding into military modernization. This military modernization includes naval advancement, where China’s navy is moving from a local coastal activities to oceanic-going “far seas operations” (yuanhai zuozhan). China’s 2013 Defense White Paper announced its intent “to accelerate the modernization of its forces for comprehensive offshore operations, develop advanced submarines, destroyers and frigates […] blue-water capabilities.” Faced with U.S. naval strength in the West Pacific, China has adopted a naval strategy of penetrating the “first island chain” (dì yi dao lian) running from Japan down the Ryukyu chain to Taiwan, establishing naval presence in its “core interests” (hexin liyi) claims to most of the South China Sea, and in a “two-ocean strategy” (liang ge haiyang) of establishing ongoing naval presence in the Pacific and Indian Oceans. Like Russia, China is accelerating its naval shipbuilding program, including aircraft carrier capabilities. A significant development in the China-Russia relationship has been their series of large-scale naval exercises held since 2012. At a time when both powers have been under growing criticism from the West, their overt readiness to publicly operate militarily side-by-side has been an act of political solidarity. They continue to claim that these drills are “not aimed at third parties,” but in reality pointed messages are being sent to third parties like the U.S. and others with whom Russia and China are in competition with. The geographic scope of the Russia-China naval exercises has been wide ranging, with each country hosting in different waters. Three of the exercises have taken place in Russia’s backyard – the Mediterranean (2015), Black Sea (2015), Baltic (2017), and Okhtosk Sea (2017). One has been in mutual areas of interest – the Sea of Japan (2013, 2015, 2017). Three have been in China’s backyard – the Yellow Sea (2012), the East China Sea (2014) and the South China Sea (2016). The 2018 exercises are scheduled to be held in the Yellow Sea, coming full circle back to the start of the cycle of exercises that commenced in 2012. With this exercise, Russia was sending a very explicit message to the U.S. and NATO. This was at a time when Russia was reinserting itself back into the Mediterranean as a permanent maritime presence, through re-setting up in September 2013 the “5th Operational squadron” for operations in the Mediterranean, to be serviced and repaired at Tartus in Syria. This was again made up of ships from the Black Sea Fleet and Northern Fleet, which of course participated in the Russia-China naval exercises in 2015. Tartus had operated under a Soviet-Syrian agreement concluded in 1971, with a view of supporting the Soviet Navy’s 5th Operational Squadron in the Mediterranean, in its rivalry with the U.S. 6th Fleet based in Italy. This Soviet squadron had been disbanded in 1992, following the collapse of the Soviet Union. Tartus was subsequently the focus, along with Hmeymim airbase, for the flow of Russian military supplies into Syria from 2012 onward. This growing Russian military role in Syria, on the side of Assad, attracts increasing criticism from European states, the U.S., and NATO, but China’s readiness to exercise with Russia in the Mediterranean in 2015 gave Russia extra support. Direct Russian military intervention quickly followed in September 2015. Russia’s maritime presence in the Mediterranean was further strengthened on 18 January 2017, when Russia and Syria signed an agreement, whereby Russia was allowed to expand and use the naval facility at Tartus for 49 years on a free-of-charge basis and enjoy sovereign jurisdiction over the base, with full immunity from Syrian jurisdiction for Russia’s personnel and material at the facility. The treaty also allows Russia to keep 11 warships at Tartus, including nuclear vessels. China’s implicit message in the 2015 exercise was to show its assertion of its blue water capabilities. A more subtle message was to accustom Europe to China’s presence and emerging maritime interests in the Mediterranean. The Mediterranean has come into the purview of the Maritime Silk Road (MSR) initiative pursued by China since 2013. In particular, the main Greek port of Piraeus has increasing “geopolitical” importance to China, a “bridgehead” into Europe; the so called “dragon head” from the MSR route coming through the Indian Ocean, up the Red Sea, via the Suez Canal into the Mediterranean. Greece’s troubled relationship with the EU had seen China stepping in with financial aid, including the running of the Piraeus port by the state-owned China Ocean Shipping Company (COSCO) since 2008. In July 2014 China and Greece agree to make the year 2015 the “China-Greece Maritime Cooperation Year.” Consequently, China strengthened its Mediterranean presence by COSCO’s acquisition of a majority stake (i.e. moving from administering to owning) in the Piraeus Port Authority in April 2016. Technically speaking the Black Sea was not the focus of the bilateral China-Russia naval exercise program. However, immediately following the bilateral 2015 Mediterranean exercise, the Chinese missile frigates, the Linyi and the Wei Fang, proceeded into the Black Sea, to take part in World War Two commemorations at Novorossiysk on the Russian Black Sea coast. Russia’s context was simple, growing assertion in the Black Sea littoral. This had first been seen in its ongoing presence in Trans-Dniester since the 1990s, then followed with intervention in Abkhazia in Georgia in 2008, and particularly manifested in 2014 with the occupation of the Crimea, and with it securing full control of the deep water facilities of Sevastopol. China’s deployment to Russia’s Black Sea coast in May 2015 in effect gave unofficial support to Russian actions in the Ukraine in February 2014, which caused outrage across the rest of Europe, and with it sanctions and cutting of various political, economic, and military links. The Chinese destroyer Hefei, the frigate Yuncheng , and the replenishment ship Luomahu sailed to the Baltic to carry out Maritime Interaction 2017 exercises with 18 other Russian ships from the Baltic Fleet from 21-28 July 2017. They first met in the waters off the Kaliningrad enclave, currently a “fault line of East-West tensions,” carried out exercises including live fire exercises, before the Chinese vessels sailed right up the Baltic to Russia’s St. Petersburg for a friendly port call. This represented a particularly far-reaching deployment of Chinese naval presence, but the context was very much Russian reassertion of military power in the Baltic, where Kaliningrad is not only the headquarters for the Russian Baltic Fleet, but is also a forward point for various missile deployments. Rising confrontation has been a feature of the Baltic. Cyber-warfare attacks have been carried out by Russia against Estonia in 2016, and NATO exercises had immediately preceded the Russia-China naval exercise – the Suwalki Gap exercises in June 2017 and the Tobruq Legacy 2017 exercises in Lithuania in early July 2017. The Russia-China naval exercises in late-July were in turn followed and reinforced by the Russian-Belarusian military exercise Zapad 2017 held in September in the vicinity of Kaliningrad, which was the largest Russian exercise since the end of the Cold War. For Russia, the Baltic Sea exercises with China were one of several shows of strength with the purpose of sending a signal not only to the Baltic States, but also NATO, which had increased its presence in Poland and the Baltic states. China in itself presented no particular military danger to the Baltic States, but its very visible presence alongside Russia sent a signal of tacit support to Moscow. The Okhotsk Sea lies between the Kurile chain of islands and the Kamchakta peninsular. 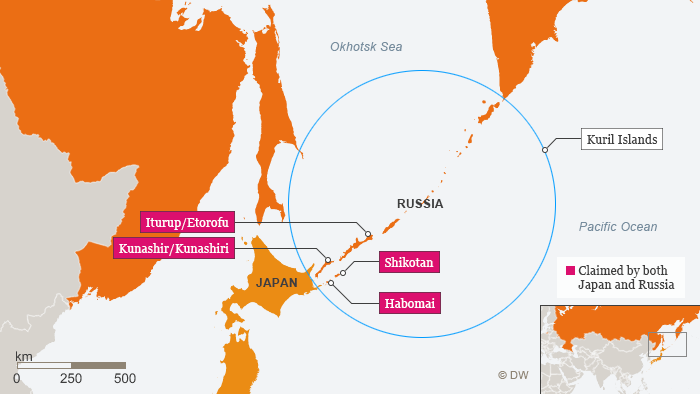 It is very much Russian waters, facing the northern Pacific and the U.S. Aleutian islands, with naval facilities at Petropavlovsk. The 2017 Russia-China exercises in the Sea of Japan were extended northwards into the Okhtosk waters in September 2017. From Russia’s point of view such military exercises support its increasing grip on the Okhtosk Sea, demonstrated with how it closed down these waters to outside shipping and fishing in 2014, which some argued will “embolden” similar Chinese assertiveness in the South China Sea. The Sea of Japan lies between the Japanese archipelago, the Russian island of Sakhalin and Far Eastern province, and the Korean peninsula. Vladivostok is the home of the Russian Pacific Fleet, currently recovering from the decay witnessed in the 1990s. Naval exercises between Russia and China were carried out in the Sea of Japan in July 2013, August 2015, and September 2017. 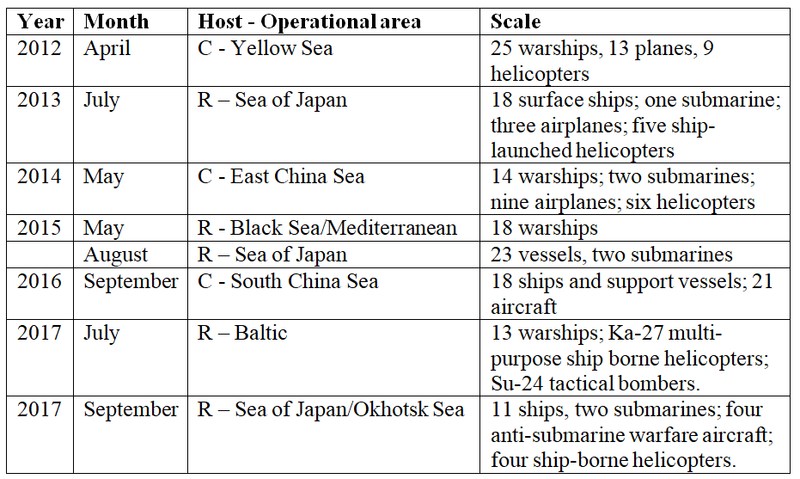 The 2015 exercises included joint amphibious landing drills, of relevance for China and Russia in their respective island disputes with Japan. The Kurile island chain is administered by Russia, but territorial disputes remain with Japan over the four southernmost islands which Japan calls the “Northern Territories.” Russia has continued to reassert its continuing grip on this chain, with increased naval strength a signal to Japan. China has no direct frontage onto the Sea of Japan, but it continues to seek access to the Pacific Ocean through the “first island chain” running down through the .U.S Aleutian islands down through the Japanese archipelago. Naval exercises in the Sea of Japan send a message from China to Japan, the more so following the 2013 exercise where five Chinese naval vessels conducted their first known passage of the Soya Strait located between Hokkaido in northern Japan and Russia’s Sakhalin Island. The 2013 exercises were preceded by live fire joint U.S.-Japanese naval exercises in the Eastern Pacific. Comments in China were pointed: “all military drills have imaginary enemies, otherwise it’s just a game. For the U.S. and Japan, their joint drills in San Diego targeted China. And the upcoming Sino-Russian exercises will obviously target Japan or even the U.S. in response.” The five Chinese vessels participating in the 2015 exercise sailed from the Sea of Japan into Aleutian island territorial waters, a message to the U.S.
Three venues for the China-Russia exercises have been in China’s backyard, namely the Yellow Sea (2012), the East China Sea (2014), and the South China Sea (2016). The two sides conducted their annual naval exercise, Joint Sea-2016, in the South China Sea with a focus on “island-seizing.” This is a key arena for China, a so-called “core interest” (hexin liyi) in which China’s “9-dash line” encloses most of the South China Sea, including the Paracels (occupied by China since 1974 but disputed with Vietnam) and the Spratlys (some land holdings occupied by China but disputed with Taiwan, the Philippines, Vietnam, Malaysia, as well as waters disputed with Brunei and Indonesia). The China-Russia naval exercise in September 2016 was preceded in July 2016 by the ruling at the Permanent Court of Arbitration in The Hague which had seriously undermined China’s territorial claims in the South China Sea, since it held that China’s so-called historical rights gave no validity for claims for Exclusive Economic Zones, and that none of the land features were proper “islands” under the UNCLOS categorization which could generate exclusive Economic Zones, and criticized Chinese creation of artificial concrete land features. It was significant that immediately before the start of the exercise Putin affirmed “we stand in solidarity and support of China’s position – not to recognize the decision of this court.” Given that China’s militarization of these artificial holdings had attracted widespread regional and international criticism, Russia’s readiness to then conduct military exercises with China, particularly involving South China Sea amphibious “island-seizing” operations, in effect provided tacit support for China’s maritime reinforcement of its position. The 2018 exercises to be held in the Yellow Sea returns their cooperation to Northeast Asia, at a time when both China and Russia are moving to strengthen involvement in the Korean peninsula, and shape developments in their favor. 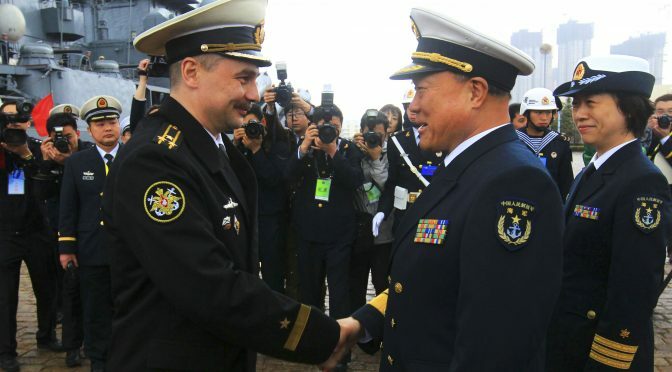 These naval exercises have become a well-established feature in China-Russia military cooperation, which are in turn part of their wider strategic cooperation. David Scott is an independent analyst on Indo-Pacific international relations and maritime geopolitics, a prolific writer and a regular ongoing presenter at the NATO Defense College in Rome since 2006 and the Baltic Defence College in Tartu since 2017. He can be contacted at davidscott366@outlook.com. Previous PostCountering Hybrid Threats in the Maritime EnvironmentNext PostWhat do the New National Security and Defense Strategies Mean for Maritime Security?